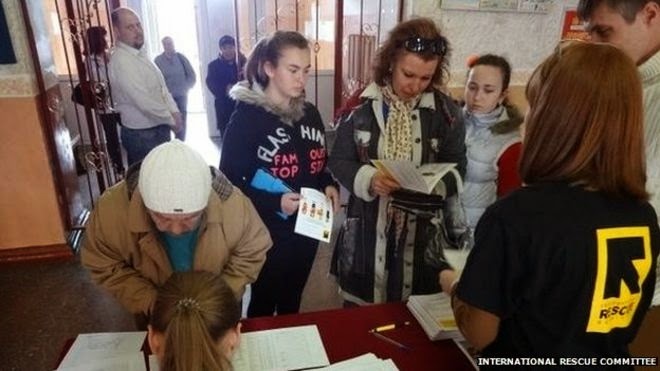 DONETSK, Ukraine -- The offices of the International Rescue Committee (IRC) in eastern Ukraine have been closed down by pro-Russian rebels who accused it of spying. The IRC says it has been responding to an alarming rise in humanitarian needs in eastern Ukraine. Staff working for the aid organisation were briefly detained as their office in the rebel held city of Donetsk was raided and searched by masked gunmen. Several employees were then put on a coach to the capital Kiev. The IRC - led by former British Foreign Minister David Miliband - has not so far commented on the expulsions. The BBC's Tom Burridge reports from eastern Ukraine says that the gunmen apparently worked for the state security ministry of the self-proclaimed Donetsk People's Republic (DPR). The West says Russia has armed the rebels and sent in regular soldiers - an accusation echoed by independent experts. Moscow insists that any Russians on the rebel side are volunteers.